The first of all I modified something from something I bought (which was downloadable) from a site called PECS for Autism obviously Josiah doesn't have autism however most sites who have anything to do with PECS (Picture Exchange Communication System) are related to Autism. The idea is that they have a schedule for the morning and they move the items over to complete once they are done. The actual product was not quite what I was after so I did a bit of modifying and put it onto two pages so it is clearly read and understood by Josiah. This is the finished product. 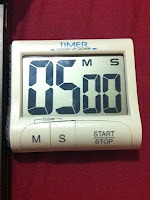 The second tool not so flash is a cheapy timer I got from Woolworths but really cool as it has large digits that are super easy to read for a young child. 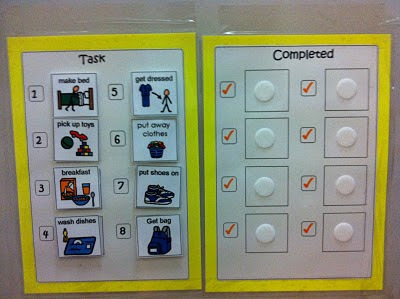 The way we use this is to give each small broken down task say a five minute time on it, to see if he can beat it. Some we give an extra minute. When he is in a good mood he really responds to this, however we are keeping everything low key (including the schedule) so the novelty doesn't wear off too fast. I love it when he says "the timer beat me again" in frustration! Last but not least once we have wrestled him (sometimes this is literally) into his school uniform, in the moments before we go to school I take him give him a big hug, tell him that he is going to have a great day at school, he is going to have fun etc... This I have learnt is one way to help change their thought processes to encourage him to believe that he can have a good day at school and he doesn't have to fear. Then I get a book Power of a Praying Parent and pray through fear and instilling a desire to learn prayers. All four of these strategies I believe work together and achieve slowly and painstakingly help him get through the tough days.